Abbeville's Court Square forms the heart of the historic downtown Abbeville and offers a unique selection of shops and restaurants. The square is a one-way street that runs from the top of the square to the bottom. The street gets its name from the historic Abbeville Courthouse which is right next to the Opera house. From the fountain to the Courthouse there is so much to do and see. In the middle of the square rises the Abbeville Confederate Monument with the Abbeville Civil War Cannon nearby. The Abbeville Livery Stable and Trinity Church are both within easy walking distance. The square is home to many festivals and events that take place during the summer. One of the events they host is "Flicks on the Bricks," an outdoor movie series. They show the movie series throughout the summer. The Abbeville Humane Society Alliance Fountain can be found in the middle of the square and is one of the 125 fountains given to communities in our country during the early 1900s by the National Human alliance. This five-ton granite and bronze fountain was installed in 1912, and its beautiful design of water flowing from the mouths of lions makes it a popular Abbeville attraction. Its upper basin is meat to be a water bowl for horses, and small cups at the bottom are for cats and dogs. The Abbeville court Square is listed in the National Register as part of the Abbeville Historic District. The city was founded in the late eighteenth century; however, most of Court Square properties make of most of the district. The district reflects the city's role as a commercial center for the surrounding county. Looking to visit historic monuments such as the Abbeville Fountain, Confederate Monument, or the Abbeville Civil War Cannon here is the place to be. If you are looking to eat at a fantastic restaurant or watch a live opera Court Square should be your go to. Court Square is perfect for a relaxing day of sightseeing, entertainment, and good food. "Walking around the square was a delight. This part of town is quaint and very historic. There are little places to eat and shops and it's like stepping back in history." "Court Square in picturesque Abbeville, South Carolina is a must see. The cobblestone streets take you back to a different era." "This is a very lovely town. 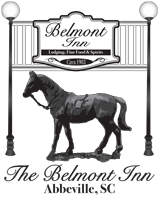 The Belmont Inn is the grand mam! Very worth a trip. The Abbeville Opera House is amazing."